You may have noticed our post this past Wednesday about Pierson playing with a toy. And when you read the caption you thought, “What!? What do you mean he was a stray for nearly a month?” Well here is the story of our new dog, Pierson. It all started with our search for a new dog. When we mentioned Border Collies on our Twitter and Facebook accounts on January 7th, 2012 one of our friends saw our post and sent us a direct message. The message gave us a number to call for a woman named Melissa who knew of a Border Collie mix and another dog who had been living at a park for some time. When I spoke to Melissa on the morning of January 8th, I found out that these two dogs had been living at Pierson Park for at least three weeks. People had been feeding them but no one had been able to catch them. That same morning, my husband and I drove 45 minutes to the park and spent about 2-3 hours with little success. Both dogs would come up to us and let us pet them and give them food, but both would immediately leave the moment we pulled out a leash. On Monday, January 9th, I went out to try again. After about an hour-and-a-half, I managed to catch the other dog which was a Chow/Lab mix. 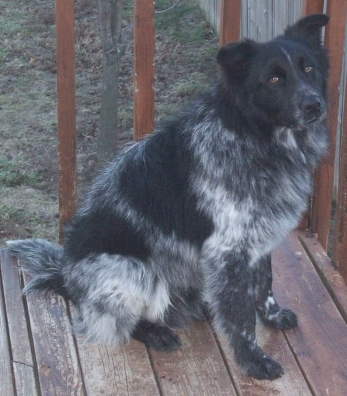 Once we got him in my car (that was huge struggle and another story all by itself), Melissa and I tried to catch the Border Collie mix again. He would have nothing to do with us after we caught his friend so we eventually gave up for the day. I couldn’t sleep that night because all I could think about was that poor Border Collie out there in the night all alone and without his other dog friend. So the next day after I attended a meeting for a dog event, I went to Pierson Park to try to catch the Border Collie mix. The Border Collie was still wary of me. He’d get close enough to let me pat him on the head but he didn’t trust me enough to come all the way up like he had the other two days. Thankfully, an older gentleman came to the rescue. He had been feeding the two dogs for weeks and he said they came up to him easily. He hadn’t tried to catch the dogs for two reasons. One, he didn’t know what to do with them if he did catch them. He already had four of his own dogs and he didn’t want to call animal control because they would take the dogs to a very high kill shelter. The second reason was because he didn’t know if the dogs would try to bite him or not. I told him how I caught the other dog and that the other dog did not bite at all. I also told him that I had nearly caught the Border Collie before too and although he struggled, he never tried to bite me either. So, the man sat in the backseat of my car, called the Border Collie to him, then picked him up and put him in my car. Just like that! I was so happy!!! The hours I had spent trying to catch the dog and he did it in less than 5 minutes. Tears welled up in my eyes and I gave the stranger a big hug. Someone else is caring for the Chow/Lab mix and working on getting him a new home. After talking to my husband we decided to keep the Border Collie for ourselves. We named him Pierson after Pierson Park where he and the other dog had been living. I took Pierson home and introduced him to Maya. The meeting went well so I took Pierson to Pawsh Wash get a bath. After the bath, I took him to the vet for his shots. Then after that, I brought him home again. Pierson will not stay in his crate. On the second night, he figured out how to get out of it. But as of today, he still hasn’t had any accidents in the house. I guess we will do without the crate. Pierson still won’t walk on a leash either. He will follow me for a bit, but he is still intimidated by it and will try to fight it from time to time. There was one other incident where Pierson’s nose started bleeding for no apparent reason. My thought was rat poison since Pierson could have eaten a poisoned rat while living in the park. I was also worried about an auto immune disease or a tick-born disease. After a night in the emergency veterinary hospital, Pierson is home again and doing well. So Pierson is a true rescue dog. I can’t even begin to tell you how rewarding it is to rescue an animal. To check out my Facebook posts related to these two dogs, send a friend request to my Facebook page at http://www.facebook.com/PetAutoSafety. You can also catch part of the story on PetCommando.com. One more very important note – If you ever try to catch stray dogs yourself, you must be very careful not to get bitten. I have been around dogs my entire life and I had gotten to know these two dogs a little bit in the days I spent trying to catch them. Because they had been living on their own for so long, it was surprising that they didn’t try to bite. Neither had been on a leash for a long time and they were terrified. A scared dog is as likely to bite as an aggressive one. Thankfully, both the Chow mix and Pierson were not aggressive. If they were, I would have had no choice but to let animal control get them. Safety first. This entry was posted on January 14, 2012 at 7:12 am and is filed under Dogs We Love. You can follow any responses to this entry through the RSS 2.0 feed. You can leave a response, or trackback from your own site. What a lovely story. Pierson is one lucky dog and very handsome too! You are going to have such fun together, I bet! What a truly warm and happy story! Thanks everyone! Pierson is doing great. He is getting more comfortable with me and my husband and our other dog Maya. He and Maya were playing earlier today. They still haven’t figured out each other’s game but they are closer to being good buddies. Pierson is trying to play with us as well but is still a bit intimidated. Since he is still young, he sure enjoys chewing. Thankfully, Maya has let him play with her toys. It is a happy story, and you made a good point about being careful. Animal control gets a bad rap but there are many people working those jobs that are doing what is best for animals, and are trained to handle scared and aggressive dogs. As for the nose bleed, I’ve not experienced that one before. Since you don’t know how long they’ve been outdoors, it could be the indoor dry air. Try a humidifier and see if it helps! Thanks so much for stepping up to help those dogs! This is an awesome story about Pierson. What a lucky dog he is. And you are special too for rescuing him the way you did. It’s good that he finally has a forever home. It is great what you have done – Pierson is so lucky! I read the other threads, an amazing and heroic rescue. Pleased the illness was nothing serious. I wish you so much happiness with Pierson and Maya too. hi that is a very good story and i am just like you i have 12 cats and 2 dogs one of the was aboused and he dose not like people at all his name is boomer the only reson why he is like this is because when my dad got him he was about 6 or 7 mouths old the people that had him before us had a bark collor on him all the time they wound never take it off of him so now he thinks that all people are bad. it took him about 6 mouths to get use to me.